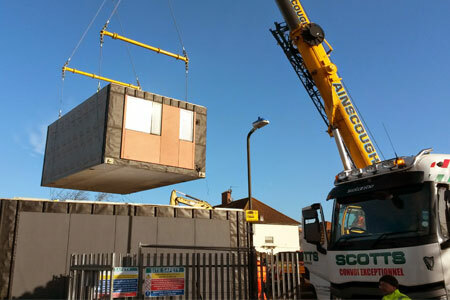 The first UK Y:Cube Housing scheme, located on Clay Avenue in Mitcham, is taking shape as 20 out of 36 self-contained one bed flats have now arrived on site. The remaining 16 units will be installed by the end of the month, and if all goes to plan tenants will move in by the end of May. All the Y:Cube units are built in the factory before transported to the site in South West London on lorries. Each identical flat contains a living space that includes a galley kitchen, separate bedroom and an en-suite toilet and shower. Despite being slightly delayed by strong winds, the scheme is now coming together according to plan. Over the last few days neighbours on Woodstock Way/ Clay Avenue have been able to witness the process step by step as Y:Cube Mitcham has slowly risen to a two storey block. The land where the 36 units will be installed was bought by YMCA St Paul’s Group in 2015, and is named after the founder of YMCA, George Williams. “Y:Cube housing is ideal for young people aged 18-30 who are in a low paid job or education, and who struggle to find affordable housing in the London area. By removing the stress and worry of housing for a good period of 3-5 years, we are hoping that the tenants will focus on getting their degrees and or promotions, whilst also saving up money for a deposit for a flat. The goal is that everyone who moves in here will have something even more permanent and secure to move on to after”.